Almost three months since the last ban wave, albeit for WoW account sharing, Blizzard has issued yet another wave of bans. This time though, for players accused of using third party software, specifically, fishing bots. Not exactly what you expected, is it? Well, it’s quite the reason to get banned from WoW. What’s a WoW Fishing Bot? A WoW fishing bot is pretty much exactly what you’d expect – a third party software, designed to fish in WoW for you, while you can just be away from the computer completely, whether doing something else or even sleeping. Although the old WoW fishing bots used to be a bit more tricky, with requiring you to not touch the computer whatsoever, since you weren’t supposed to move the mouse, newer bots are a lot more fancy. They can be even set to throw certain items out of your bags upon looting them, keep only a type of fish, reply to whispers or pause itself / alert you when a player is nearby, and even fly to the nearest mailbox to mail the fish to an alt, so the bot has empty bags, then back to the fishing spot. 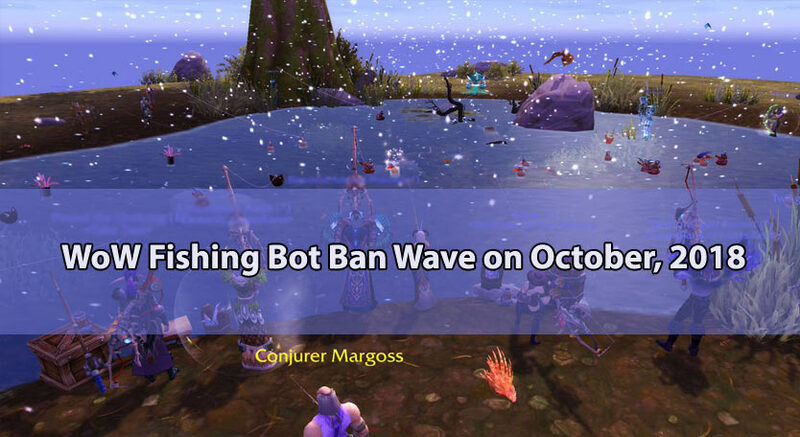 While admittedly this can give some players ideas, we always recommend not to, since, well, you have the proof of what can happen right before your eyes, namely this post about the latest WoW fishing bot ban wave. As for this particular WoW fish bot, the third party software in question was called LazyFish, and wasn’t as fancy as the ones we described above, which usually is avoided to not further create detection room. Despite that, LazyFish has just been confirmed by its developer that players using it have been getting banned. All while the bot was described as being 100% passive, without any memory writing or reading, so Blizzard definitely took this seriously. What type of bans were issued for this WoW Fishing Bot ban wave? For now, all the ban reports following the current WoW fishing bot ban wave seem to be suspensions of 6 months, with much harsher ones for “repeat offenders”, such as 18 months of time off. While there aren’t any current reports of permanent bans, I’m pretty sure some permabans were also issued. As for the regions affected, both EU and NA WoW players accused of using the fish bot were suspended, albeit for now, it seems that the majority of bans were on EU servers. Regardless, the safest method of not getting banned for botting, is well, not to use any bots, but if you really want to, now is certainly not a good time to do so. And more so, if you’re among the lucky ones that “got away with it”, it’s best to stop using LazyFish, as even its developer said so, or any other bot, at least for the time being. Now, there’s no secret that when it comes to ban waves, there is room for mistakes and false positives. And this current fishbot ban wave seems to be no different, as quite a few players state that they’ve been suspended unfairly, while fishing legitimately. As for this current ban wave being affected by the change of Blizzard’s president, I really doubt that, since Blizzard takes quite a while before they issue a ban wave, and certainly that time is longer than a day. And lastly, should you have been affected by the current WoW fishing bot ban wave, don’t forget that we are here for you, should you require our WoW unban service!